ok, i’m a chinese crested owner (a hairless dog). i also have fibromyalgai. 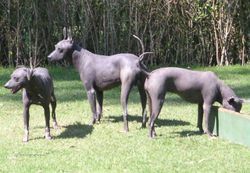 i just thought this was an interesting article about people using hairless dogs, xolo (of course cresteds would work as well) as therapy dogs for the treatment of pain conditions such as fibro. of course just having a dog or two or four always helps keep the spirits up! sorry about the formatting. i can’t seem to get this to flow correctly. i was sharing online about my fibro and of course my history as a person recovering from substance abuse and…what happened when i was treated long-term for pain management. bits of this story are strewn through out my blog. but this is a bit of how my fibro and addictions interacted. again, this is my story and my opinions…remember this is a blogg page and what i say may not work for, or be relevant to you. this information is not to be used in place of seeking professional help. please, always discuss your situation with your practitioners. please, always do your own research. head out of my…the ground. around me ever said anything…even after my disaster with the pain meds. long term treatment with benzodiazapines can create those symptoms in most patients and your body will be…physically dependant…meaning if you stop cold turkey you will wrestle with withdrawal. and after a short time, with out constantly upping the dose, you are no longer receiving anything more than a placebo effect…you are just avoiding going through withdrawal. the withdrawal mimics what you’re taking the drug for and resuming it simply stops the withdrawal symptoms, appearing to fix the anxiety again…and so starts a crazy cycle…but it’s a cycle that’s difficult for me to describe well. go to benzo.org for more research on the topic. klonopin to withdraw from…yeah give huge bottles of klonopin to a person with a history of suicide…begging for trouble…but i wasn’t going to go there, even though i felt like it many times. believe me i could rant on over how betrayed i felt by my medical community after over 11 years of compliance and hard work. but i need to stay focused on “the solution”. well, i set out to learn how to withdrawal and what to expect. rough. i took just over 3 months or so. april 25 was the last day i took a dose of klonipin. no more p-meds. you ever want to read some. it’s off focus re fibro…i am still taking lyrica, and i’ll wait a bit before making a decision about that one. i’m not fond of it but it seems to help quiet the symptoms. so many similar stories and far too many go unchecked because of the stigma. the number since so many poor people don’t know what’s happening to them. or they’re just yanking them off with horrible consequences. sourcing. i’m sure people will read my blog and perhaps they forget that this is mypersonal blogg page. i’m expressing myopinions. granted i don’t buy into conspiracy theories and i read more peer reviewed research than i need to, but what i say and write is still my opinion. this is not a medical site but what i write is a response to my personal experience and…research. have my license one of these days. god willing. is in living with it i guess. since fibromyalgia is a complex disorder that requires a multi-disciplined approach in its treatment. there is no one correct, end-all, be-all approach for all people. in the beginning (before ’01) i had gained a lot of weight (i am typically pretty small) and my ability to exercise and manage much of anything had disappeared. not exactly the person you meet today. but from the beginning i had been advised by every doctor i saw to push through the fatigue and pain. it seemed overwhelming and i could not understand why they would ask me to do that. but i did a endless hours of research over the years and began to do what my docs and the research were telling me. i discovered focus on relaxation and exercise is many fold and is supported by all major research and medical foundations such as the arthritis foundation and mayo clinic. it seemed to me that people who were getting better were the ones who’d found relief when they have adopted a routine including exercise, relaxation, healthy sleeping habit and other life management skills. this adaptation was not easy and i was faced with it before i had a diagnosis. i am not more motivated or have less pain than anyone else. i’m a fairly average person. so, i’ve felt hurt when people look at me and say “you’re just stronger” or “well your pain’s not that bad”. but not every day is good and fatigue drags me down to a halt during flairs. the person you meet (on a good day) today, is not the person i had become years back. it took major attitude adjustments (2×4’s to the head, knees, legs, feet…) and learning…trying things and failing…to find some relief from the most disturbing aspects of this disorder. but first i had to become open minded and willing. the pain was in my body, but as i’ve seen with so many others in some horrible chronic situations…it’s all about the attitude! that’s no small thing. i fought everyone and didn’t think they knew what they were asking me to do! i was angry all the time. i couldn’t understand and i thought my doctors were quacks and incompetent. now, my song is changing as i’ve changed. they’ve become my partners in trying to make it through this maze. but i still get tired and the pain flairs…i still have days that i feel i can’t do anything. i have bad attitude days…and that can be expected. i have to remind myself that i didn’t make myself sick, but with help, i can get myself muchbetter. slowly i’m noticing progress. but it’s progress not perfection! regarding exercise, i learned it must be geared towards the person with fibromyalgia. “regular” exercise classes are often too strenuous and fibro patients leave because they do not benefit from those. exercise done incorrectly (for a fibro patient) can, in fact, exacerbate the pain and fatigue. the gentle exercise outlined by the arthritis foundation and others will work, but it takes time and doing and must be done as regularly as possible. that coupled with correcting sleep disorders (the gentle exercise goes a long way to do that by reducing pain, raising serotonin, releasing endorphins and helping us to be tired at night…avoiding sleep during the day) because lack of sleep compounds and results in most of the symptoms fibro patients deal with, when healthy sleep patterns are restored most symptoms improve or disappear via that channel as well. for me, my fibro seemed beyond debilitating…my life as i knew it stopped. for years things got worse until i couldn’t take it. it was either end this life or try this option…(yes i’ve become totally despondent and hoped for death rather than living like this). the medications never helped and any other passivetreatment i tried…didn’t help. from all research i had gathered, and on line support networks i had participated in, this is the one of the best medicines that seems to have been offered, not only to me but far too many others who i’ve communicated with or read their stories. it can sound disheartening to leave a doctor’s office with the advice being go and exercise and get better sleep (god i came to you for help and you tell me to go help myself? ), but there is a reason for that. for one dr.s and research do not have a clear enough picture of what fibro is…and believe it or not…this is not the only disorder that the person with the job description of “doctor” has to deal with. with still foggy descriptions of what fibro might be and how it mightbe treated…they all do their best. the ground rules are somewhat clearer, but still, not exact or complete. rheumatologists are, at this time, the recognized specialists for fibro…at this time. that is where the major advancements are being made in treatment and diagnosis. at this time there is no pill or treatment that has the long term, wide reaching benefits that countless research efforts have shown with the exercise, sleep and stress management protocols. combined, they do work if we let them. a doctor can’t do that for us…i believe that we are personally responsible for our care. i found that when i stopped being angry at the medical community and started helping myself…i improved. the reasons for that, again are multi-fold. that shift resulted in self-empowerment and knowledge which goes a long way to helping us feel better and regain a foothold in a life that has…slipped away. we regain a sense of self and self-esteem that we lost to criticism and doubt. when no one could seem to help us our self-esteem shattered as people questioned “why can’t you just pull it together and stop spending all of your time in dr.s’ offices?”…like that’s what you really wanted…but true…you were going to have to start paying rent at your dr.s’ appointments. we never like to hear that “it’s all in our heads”. all chronically ill people fight that stigma at different stages of their process. but the most significant change for the better in our treatment does happen in our minds. when our outlook and attitude changes…our prognosis improves. this is true of any chronic illness or situation. fibromyalgia is not unique that way. and if you’ve read my blogg you know that i’ve dealt with a few chronic illnesses. all though by no means is “exercise” the only protocol i’veused, as many disciplines are necessary to reboot a life that has been halted by fibromyalgia, hopefully the group (a new support group in town) can bring ways of implementing various protocols that are tailored to the person with fibromyalgia. while we hope for other medical progress to be made in bring relief for the major symptoms of pain and fatigue, etc, that may still be long in coming and this is the “best practice” at this time. chances are that this will always be a standard protocol as it is and has been for decades, for so many chronic disorders and well…just living well. i will share that i take lyrica…i think it helps some but i’m not fond of the side effects. i’ve taken it regularly for several months and was on neurontin for years before it. i hope that some of the protocols i’m following might allow me to get off the lyrica too, but in time…one thing at a time. road blocks in healing and polarity therapy: what is it and can it help with…. an interesting book that my counselor gave me by caroline myss, phd, called “why people don’t heal and how they can” (also wrote “anatomy of the spirit”) deals with incorporating energy work into a holistic mind, body, spirit approach to healing. now i know the title might put you off, but i’ve been following other works that deal with “road blocks” in healing and this is a positive and good read if you’re experiencing “being stuck”. i’ve been at this “wellness” gig for over 20 years. i began searching out many spiritual and nutrition based approaches as a teenager. initially i was concerned with the usual teenage issues like acne and weight but what i discovered, worked, so i stuck with it. as i was digging around that community, which was very small back then, i met a lot of people and was turned on to a variety of readings and experiences. i was learning about ways to heal some deep inner pains that i was already wrestling with, and having some horrible consequences from very bad, maladaptive behaviour and personality issues. i became a devout buddhhist in my early twenties and the search continued. but i am convinced from the many positive experiences that i’ve had, that this whole arena of mind, body, spirit healing is key for living well. i still struggle with a lot. i’m not whining, but life just can never be normal for me. i keep stumbling across huge hurdles and crashing into brick walls. by now my problems must largely be due to brain damage from all of my collisions with life! but MRIs and other say that, anatomically, i seem “normal”. my gastro. dr came into the room a few days back, sat down and looked at me squarely and said “your tests are normal but…you are not!” and we laughed. so, after over 11 years on a battery of psych meds for bipolar and spotty treatments for fibromyalgia, i felt i was not longer benefiting from the pharmaceuticals and was going broke in the pursuit of maintaining that. i guess i’m finding out that no matter which direction you go in…if you live out here…it’s not going to cheap and access to help is going to be limited. moving is not an option for me. so i have to work with what i can learn to do. just what can i do from learning? i can maintain a healthy diet and exercise (walking, yoga, physical therapy). i can work on my spirituality (reading, AA, community). i have limited access to a counselor but she’s great and that’s what counts. books and videos are helpful. i have a good thing with my AA community and they do what they can (moral support and other help). there’s the phone, which can be my lifeline on days that i’m not doing well. the internet provides many opportunities to learn of up to date information on nutrition, techniques and therapies. while attending classes and having practitioners would be optimal…you do what you can. at best, things can get frustrating…very. but when the rewards appear and even if they’re small, it’s great. you learn to appreciate the small things because healing from life long spiritual wounds and chronic issues is a slow process. i may rush with some things but i can’t afford to be down for long or maintain costly therapies that i have no funds for. but much of my process is about patience…the patient practices can be a long and lonely journeys some days and it’s easy to get despondent when you are just plain hurting and down. i’m not a monk…i’m just human…a sick human trying to heal. while i’m off all of my “psych” meds i am still taking lyrica. i don’t think i’m fond of the lyrica? i take melatonin and it does help me sleep very well and i wake up feeling good. i ran out of guaifenesin a couple days ago and found out just how much that was helping my fibromyalgia. i ran into the 4 corner town a few miles down the road to see if they just had something containing guaifenesin…i didn’t think they’d have what i take, but i found it…after half an hour i was feeling much more on track. gaufinesen an oddball therapy for fibro but it was in the book my dr. gave me and i thought i could try it…it seems to really help. (Fibromyalgia and Chronic Myofascial Pain: A Survival Manual (2nd Edition) by Devin J. Starlanyl and Mary Ellen Copeland) also a good article on guaifenesin therapy: http://www.fibromyalgiatreatment.com/Articles_HYSTERIA.htm for now, i’ll take any help, because simply being able to do anything but lay on the sofa is an improvement and i need to be able to be up, moving around and communicating. i’ve got a lot of writing to do and i’m just trying to avoid it right now! well, i do have a bit of a bee in my bonnet. it’s about the accelerated taper schedule i needed to follow. i don’t harp about my life’s circumstances…the one thing that can drag me down faster than my illness, because it won’t help things and it’s not the topic i’m working with. but i’m sensing some bristling of hair regarding faster tapers. i fairly, thouroughly understand the multifasceted need for doing a slow, supervised taper. many people make sacrifices in order to manage their health. but when you have nothing left to sacrifice…well, i think there is a great lack of empathy for the circumstances of some people needing to get off meds. this may be a hard concept to wrap your head around, but protracted withdrawal is a luxury people take for granted. i’m sure you can throw a list of how you have been able to do lengthy tapers with limited resources…but do you live in rural appalachia? my county (s.e. ohio, west virginia) and the neighboring ones, make national news for joblessness, hunger and poverty all the time. my mother sends me the articles from the chicago tribune! we do have an extraordinary situation here. being poor in or near a large city is very different than being poor and living hours from a major city and living in a region not known for being “progressive”…we are not a hot spot or major destination for research and development. yes we have pockets of that if you’re looking at obesity, diabetes, COPD, etc…poverty isa major contributor to those things. it is easy to condemn what you don’t know…believe me, there are a lot of unknowns. being poor and new on the learning scale does not make one the enemy…we just need accommodations…so many of us give up the good fight because of the stigma. but if you’re diagnosed mentally ill and you’re dealing with income issues maybe you can begin to have some insight into what “stigma” means? i avoid this topic because going there…i can find myself feeling irritated….i’ve been butting up against it for too many years now. (i’m fortunate it hasn’t been my whole life. it may be harder because, for most of my life i was reasonably successful and i have a hard time understanding why i can’t pull myself up. but i’m understanding how people can “get stuck”. i just don’t want to stay stuck. i believe i can get out of this. but judgement and stigma can put more weight on you than almost anything…if you let it. i won’t so that’s why i’m writing instead of feeling hurt, defeated and just walking off. i don’t have a lot of love and support around me…except for AA where i let people in. i have no available, supporting, family or a spouse. my love and support has to come from with in and from god. in an area where just day to day survival is a massive struggle…mental illness and surrounding issues are a luxury. that may be hard to swallow…but if one can’t understand that, then you are probably blissfully ignorant or naive! (check out mental illness in developing nations! my friend just came back from a 2 month visit with her family in kenya, after being in the US for over a decade. she was given diagnosis here but…that’s still another issue worthy of inspection so you don’t take for granted what you have here.) i am back in survival mode. i am not considered quite “poverty” and don’t have medicaid. i have medicare, but don’t have enough of an income to afford uninsured care (and most insured care). i can’t work right now, and often can barely manage a shower and making it to an AA meeting. thank god for AA because it’s free, but i have to be able to make the 25-30 minute drive to and from! but i don’t have a husband, family or really friends that support and understand withdrawal and fibromyalgia issues. my friends and community are good people but this is not their gig. this is a rough spot to be in! i would have never understood it myself, if i hadn’t found myself in this position. living here over 11 years and i was ignorant and naive to this. being caught in the middle of the socioeconomic stratas is just that, caught. i’m not using the words ignorant or naive to be cruel or condescending…they are by definition, the appropriate words. at least i can find some information that is helpful, but i have to be able to do it or it’s just “information”. i always thought that where there is a will there is a way. but “way” requires money and access. and hey no money no access! even supplements are ungodly expensive. in the past i could afford them. so necessity is driving my schedule and my life now. some of us are…no all of us are doing our own personal best. and we all have our own personal necessities…i like to call it personal velocity. this is largely uncharted area that we are going into. little is still really known, and much research is showing up about both withdrawal and fibromyalgia. we know more now, but we are still learning! each of us are pioneers in trying to deal with these health issues. i think we have to be supportive to everyone’s approach. there are many strong feelings and there will be in these fronts. but if we let our emotions and opinions divide us (even a very informed opinion is still…an opinion) rather than showing support for the entire community we will greatly weaken our efforts to move forward. i have been fortunate to have been in AA for over 10 years. i have a lot of experience with diverse populations finding many paths to a common goal. it is the common goal that holds us alcoholics together, not our means. yes, we all practice the 12 steps, but even each take on the 12 steps can vary. if we scrawbled about the details, the AA support circle would shatter. the common goal we in the “off meds” community share, is living drug free (or with minimal medication). we will get there if we maintain that focus. everyone has something valuable to contribute…for now we really only have each other. with love and room for growth…more people will join the ranks of being able to actively contribute and support others. contempt prior to investigation…not cool. don’t pass uninformed judgement on the choices others have to make in their healthcare. we are not equally provided for or have equal access in that arena…not even in, god-bless-america. not even with information. we can not demand it becuase we have to do for ourselves…that recquires creativity and weighing options…assuming you’re fortunate enough to have them. PEOPLE DO NOT HAVE EQUAL ACCESS TO HEALTHCARE IN AMERICA…please understand this becuase it’s real and its now and it hurts. big pharma would love to devide and concour us, but why bother if we do that to ourselves. detox: tonight will be the first night i don’t take my benzo, klonopin in over 11 years! but i’m wrestling with poor sleep patterns. april 25, 2008…hopefully that will be the day i can say was the first day i went with out taking a benzodiazapine, klonopin. it would be tempting to say that today ends an 11+ year addiction and a several month struggle to safely off the drug. no, today is really the beginning of this new chapter in my life. years of therapy, involvement in AA and a relatively brief withdrawal period have offered me many opportunities to develop life skills and tools for dealing with life. the biggest problem i’m perceiving right now is sleep. the last couple of weeks have been filled with poor sleep patterns. poor sleep is also a part of the territory that comes with fibromyalgia (d/x, 2001)…so it’s a bit of a double whammy here. healthy sleep is not really negotiable (not even in a healthy person). getting a good night’s sleep can be a larger determining factor in how the next day will go, over about any other factors there may be! if something isn’t going well, it’s usually attributed to not sleeping. like this morning…my thinking is still cloudy, i’m just wiped out and the pain is “annoying”. yes, i’m taking 300mg of lyrica and the first two symptoms i mentioned can be side effects of that drug…but i’ve been taking lyrica for several weeks now, and those other issues always become more intense when i’m going through bouts of poor sleep. as we all know well, by now, healthy sleep is kind of the human version of “rebooting”. sleep supports our immune system, rebuilds and repairs our body, it helps with fatigue, pain, depression to name a few. even irritable bowel can improve when sleep is regulated (but flairs when sleep is poor). an aside/rant: many of us prefer not to take drugs/meds to manage symptoms. i’m joined with that school of thought. i want to discover the root cause of my problems and find a way to improve my overall health. yes, modern medicine is obsessed (and rakes in the cash) with chasing symptoms. honestly, every med that i’ve been prescribed was given to simply manage a symptom but never was there any meaningful help in addressing the cause of my problems. ok, by my own admission, i’m a little nutty…i have had mental health issues…but my life is not simply composed of symptoms…my disorders are real. i have real disorders with real diagnosis. i hate being manged differently than non-mental health patients. but that’s a discrimination that is older than time, and honestly…i have problems with the same discrimination issues raising in my own mind when dealing with another mentally ill person. so, i understand where docs and others are coming from. but fact remains that efforts to get off addicting medicines and deal with disorders like fibromyalgia can require good medical support if a patient hopes to be successful in navigating.for the most part, many of us have waded through these waters with our own research and the support of our peers who are doing the same. in this information age, that’s not so bad. taking action to manage our own health care can help empower us and put us in the driver seat. that boost in self-esteem is a tremendous aid in dealing with any disorder. now, achieving good sleep hygiene…there are sleep specialists everywhere, so many good articles and so much research done in this area, that it’s almost amazing that we, americans, have such tremendous struggles with this 1/3 of our daily cycle. but then you look at our whacked out lifestyles and it’s no surprise. we are a society geared toward promoting and supporting frantic, ADHD-like living! how can we possibly prioritize doing “nothing” for 8 hours! you gotta look at your other 16 hours and evaluate them. how are you feeling, are you effective…the entire list. if those 16 hours, that you’ve now turned into 20, are not the greatest, then…you can probably optimize your original 16 into being more functional and productive than the 20 if, you give those silly 8 hours of, doing nothing but sleeping, a high priority. those 8 hours of sleep will do more to determine how the next 16 will go, than any efforts expended during those 16 hours, or almost any drug, relationship, meal…you name it. no, life can’t be all about sleeping…but it really is. i believe we can only go apx. 5 days with out any sleep (more or less). we will become psychotic, our systems will shut down. i’ve read rats only live 2-3 weeks with out sleep…whatever the exact measures…fact is we can’t live without sleep. personally i try to break my life down in to three 8 hour portions. my 8 hours of sleep must be done in the same slot…together. but my 8 hours that should be work and 8 hours of general living: transportation, chores, eating, socializing, personal care…they can often be shuffled a bit. but i find breaking things down this way, budgeting and scheduling, actually gives me more time. i find time i didn’t know i had. so in using tactics like that, i find that i can safely set aside 8 hours to manage my sleep. it is do-able and essential. i have to think…i would not just not show upfor work or class, or decide to work only 3 hours out of an 8 hour day…i make meetings a “must do” priority…why can’t i do that with sleep? well…now…at 45, after being clobbered with illness, i would never try to cheat on the time i give to sleeping. i try very hard to avoid naps and try to keep to a regular schedule. here is a page on webmd that has a variety of articles about sleep: http://www.webmd.com/sleep-disorders/default.htm i needn’t go into extensive lists here. i’m sure most of you have been down this research road many times, as sleep disorders effect all of us. when you have to deal with meds and chronic disorders…this issue becomes a fact of life…and dealing with it is nearly a life or death issue. i probably needn’t remind many of you, but i need to remind myself. i’m falling back into a horrible sleep tangle again and meds are not an option…i gotta do it through lifestyle. so, tonight, i’m going to bed without any klonopin, and upping my melatonin. enjoy your precious 8 hours.